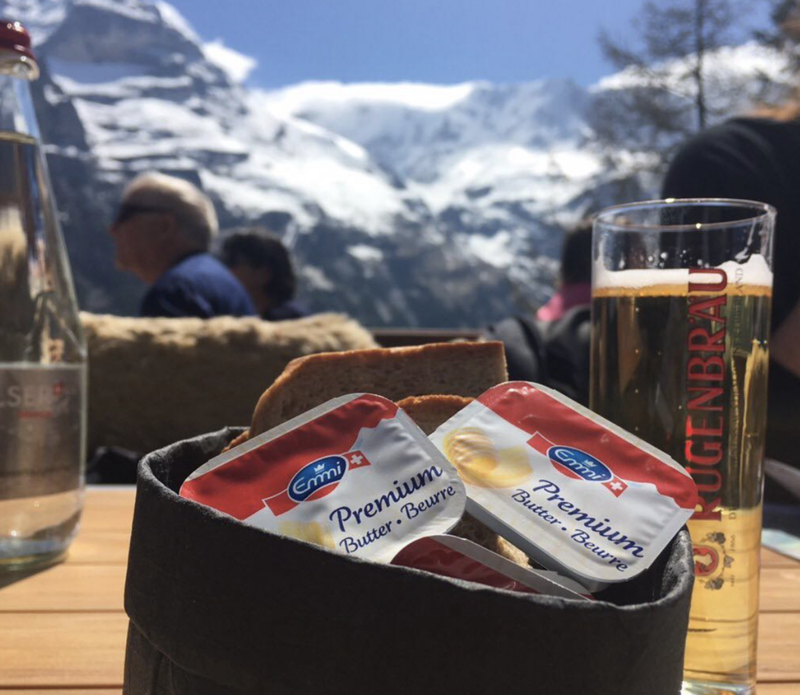 First butter in Switzerland. Yum! Often I will start cooking a recipe and realize that I have forgotten to allow my butter to become room temperature. Luckily I have a few tricks that I use to help remedy the situation. Below I have listed a few of my favorite butter softening techniques. 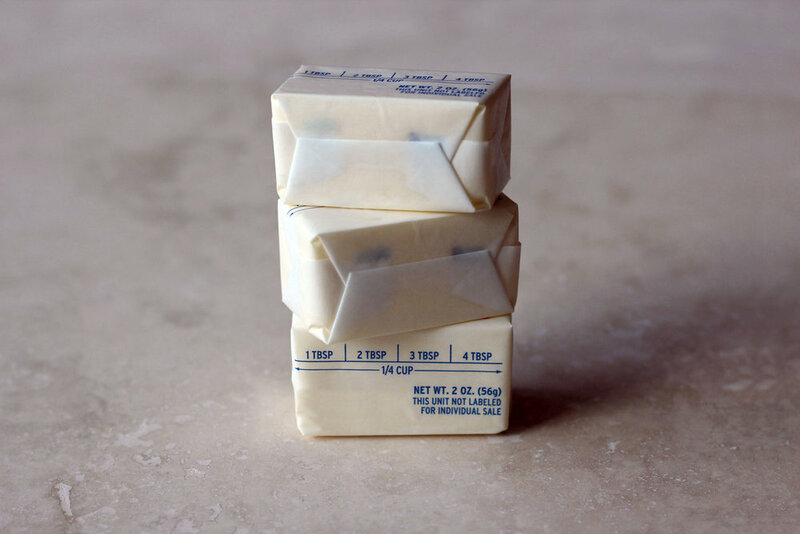 Refrigerated butter will take approximately 30-45 minutes to get to room temperature on the countertop. (Of course this depends on the temperature of your room.) Frozen butter will take a few hours to fully thaw. Remember to measure the required amount of butter needed for your recipe before trying these softening tricks. It can be messy to try to measure afterwards. My favorite way to quickly soften butter is to grate it. Grating works well for refrigerated or frozen butter. I usually grate the butter directly into the mixing bowl. You can also grate onto a plate or cutting board. Keep butter wrapper on and peel away as you go. The packaging will help keep your hands clean. Some people recommend using a cheese plane to cut thin slices of butter. I found this more difficult than grating. Take refrigerated butter and place between two sheets of waxed (or parchment) paper. Hold rolling pin handles with both hands and gently pound the butter evenly to flatten to 1/8 of an inch. Remove the butter from the paper before it becomes too soft. Cut butter into small chunks and let sit at room temperature until the butter yields to light pressure. HOT BOWL – Place refrigerated butter onto a plate. Find a bowl and fill with hot water. Allow the bowl to fully heat up. Pour out water and dry bowl. Invert bowl over the butter. Let sit for a few minutes. CREAM - You can cream refrigerated butter. Chop up into small pieces and use a stand mixer or hand blender. Blend until soft. MICROWAVE – Some recommend softening butter in the microwave, but I don’t. Heating butter in the microwave will alter the emulsion. I only use the microwave if my recipe calls for melted butter. I love using my butter paddles from Churncraft. You can chose to use the textured or smooth side. Take a look at the tutorial on how to make butter balls here. I have looked at many books that have information about making butter at home. Ashley English's book is one of my favorites. Unlike many home dairy books, this one has a comprehensive chapter dedicated to butter. Ashley English provides a feast of information for dairy-loving foodies! She guides readers through all the essentials in four topic-specific sections: Butter & Ghee, Cultured Dairy Products, Cheese, and Ice Cream. Each primer offers need-to-know facts with gorgeous photos, troubleshooting tips, profiles, and Ashley's own roster of recipes. Ashley is the author of four books in The Homemade Living Series – Canning & Preserving, Keeping Chickens, Keeping Bees, Home Dairy, as well as many others including A Year of Pies, A Year of Picnics, and Quench. Today is my husbands birthday, so for breakfast we served eggs and pancakes with fresh homemade butter. Homemade butter makes breakfast extra special. I made a batch of delicious butter with my new Churncraft butter churn. It took less than five minutes for the heavy cream to convert into butter and buttermilk. I am excited to use my new butter. Out of all of my Mini Mosaic tile choices, I choose Bread and Butter today. I contacted Bishop Lennon at Bishopart to she if she would allow me to purchase her bread and butter image to put on a custom tile. She agreed and I love it! Restaurant: Located in the SoMa district of downtown San Francisco, Benu is a restaurant known for its complex tasting menu. Influenced by many cultures, Benu explores how Eastern and Western flavors, ideas, and aesthetics harmonize with each other. Established in 2010, the restaurant is housed on the ground floor of a historic building that dates back to 1922. Benu has received four stars from The San Francisco Chronicle, the AAA Five Diamond Award, and in 2014, Benu was awarded the highest rating from the Michelin Guide, the coveted (and rare) three stars. Chef: Born in Seoul, South Korea, Corey Lee’s family moved to New York when he was five years old. Influenced by his mother’s cooking, he took his first kitchen job at 17. Lee traveled and worked in Europe and New York. His career has spanned over 20 years of working at some of the most acclaimed restaurants in the world, including a tenure as head chef at The French Laundry where his work was recognized with a James Beard Award. In 2015, Chef Lee authored the cookbook Benu–a collection of recipes and essays that explores the restaurant's food, influences, and people who make it possible. 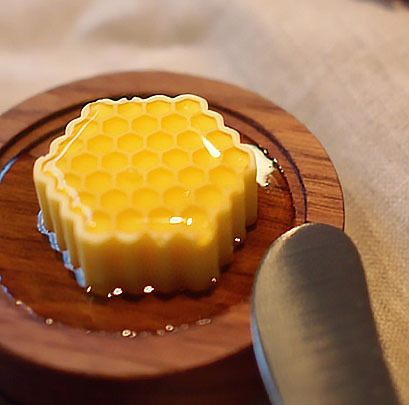 Butter: Chef Lee’s butter is like a work of art in flavor and design. The butter is drizzled with ginseng-infused orange blossom honey and topped with Sinan sea salt. (Sinan sea salt is produced in the Sinan Archipelago of South Korea) Warm sprouted grain bread complements the disk of butter that is embossed with a honeycomb pattern. I am so excited. My new Churncraft butter churn arrived. This is a hand-powered butter churn with a 4 quart glass jar. Churns two quarts of cream into approximately 1-1.5 lbs. of fresh butter and approximately 1 quart of buttermilk. The churn comes with a mat that keeps the churn from scooting around on your counter while you are making butter. Wooden Butter Paddles are the perfect tool for processing and shaping your homemade butter. The grooves efficiently wick away buttermilk. This kit includes grease-resistant butter paper, baker's twine and nicely designed gift tags for twenty packages.